Swollen gums are a relatively common condition, and they can paint a picture of your overall dental health. Your gums are a vital structure within your mouth. They anchor your teeth in place and nourish them. Without healthy gums, your teeth cannot thrive, and without healthy teeth and gums, you can’t enjoy overall health. So, What Do Swollen Gums Have To Say About My Health? If your gums feel swollen or tender, it could point to one or more of the following problems or causes. Most medications have varying degrees of side effects. If the swelling in your gums happens to coincide with taking a new medication, you should raise this with your dentist or doctor. There may be alternative medications available that do not come with this side effect. Different kinds of toothpaste contain various chemicals and ingredients. 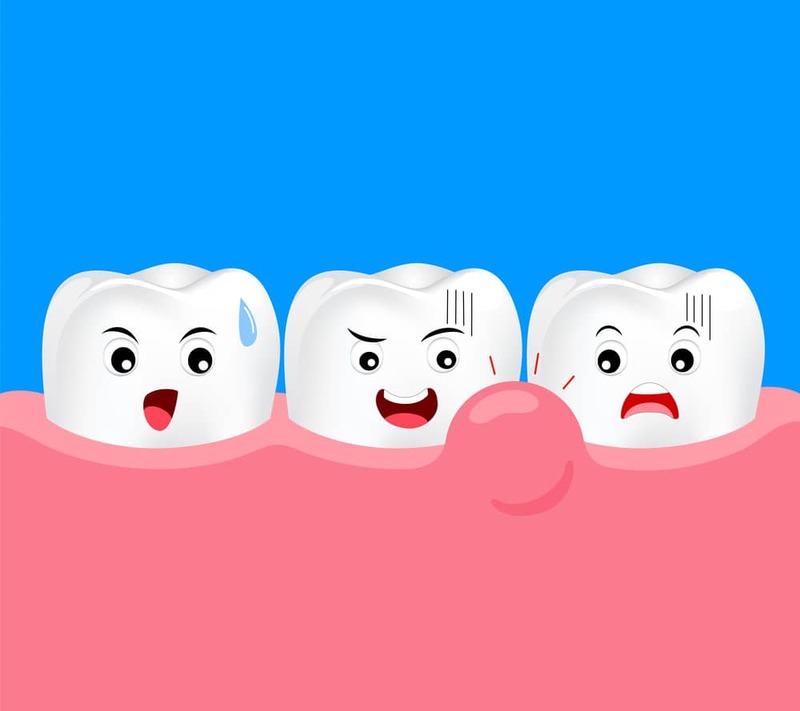 Swollen gums can often be a result of switching to a new brand of toothpaste, mouthwash or floss, or using a new toothbrush. If you notice any swelling in your gums, switch back to your regular brand and see if the swelling subsides. Swollen gums are often the first sign of some sort of gum disease. In most cases, you will be dealing with a minor case of gingivitis that can be treated by improved dental hygiene and a professional scale and clean. However, it could be a sign of more advanced gum disease, which requires immediate dental intervention to prevent a progression to periodontitis and late stage gum disease. When it comes to your gums, you really are what you eat. Swollen gums are often a sign of poor nutrition, and Vitamin C deficiency in particular. A diet full of whole foods, fruits and vegetables will keep your gums healthy. A menu full of processed and sugary foods will do the opposite. These are just some of the reasons for swollen gums. It’s always best to visit a dentist and have your gums checked to find the root of the swelling, and get it addressed as soon as possible. How Can I Avoid Swollen Gums? There is a range of things you can do to avoid and relieve swollen gums. Good oral and dental hygiene is the best way to both prevent and relieve swollen gums. Healthy gums don’t swell – bacteria, plaque and calculus cause swollen gums. You need to brush twice a day and floss daily to keep your mouth and gums bacteria and plaque free. More and more health professionals are coming around to the importance of diet. In fact, what you put in your mouth may have the most significant say over not just your oral health but your overall health. Our bodies thrive when we eat lots of fruits and vegetables. They are full of the vitamins and nutrients our gums rely on, so fill your plate with plants and restore the health of your gums. If the swelling becomes unbearable, you should rinse your mouth with a salt water solution. Just add a teaspoon of salt to warm, but not hot, water and gargle. The salt disinfects and reduces the pain and irritation of swollen gums. People that see the dentist at least every six months rarely suffer from serious oral health concerns, and it’s even rarer they suffer from swollen gums. Regular check-ups mean regular professional cleans. Brushing and flossing get rid of most bacteria and plaque, but not all. Professional cleans do the rest. They are a vital tool in protecting oral health and even more vital in guarding against and reliving, swollen gums. There are a few things you definitely shouldn’t do if you have swollen gums. Firstly, never continue to use toothpaste or mouthwash that you feel irritate your gums. In fact, you should stop using mouthwash and toothpaste right away and find a gentler option. Perhaps most importantly, you need to stop all the activities that are causing swollen gums. If you smoke or consume alcohol heavily, you need to cease both habits. Both irritate your gums. To protect your gums, you should stop smoking forever, and once your gums are back to full health consume alcohol moderately. The worst thing you can do is ignore the problem. The importance of your gums in relation to your oral and overall health cannot be ignored, which is why swelling is so serious. There are things you can do to relieve the pain, but even the smallest amount of swelling should be looked after by a dentist. Early intervention can save you a lot of pain. Late stage gum disease is serious and hard to treat. It results in loss of teeth, bone density and interventions are often invasive. You can avoid this fate with proper care. Look after these essential structures, report gum swelling right away.